Tattoo Secret Kit is available to buy from http://www.tattoosecret.co.uk. The site provides the shade range for simple selection and further application tips from Maggie Richards. Don’t worry the new Tattoo Secret Camouflage Kit has arrived in time to carefully conceal your tattoo throughout your special day, leaving skin flawless and tattoo hidden. It top secret. Shhh! It’s the big day, plans are well underway, dress sorted, hair and make-up organised, BUT oh no what about the tattoo! That shoulder tattoo is not going to fit with the beautiful wedding dress and what will the mother in law say! Don’t worry the new Tattoo Secret Camouflage Kit has arrived in time to carefully conceal any tattoo throughout the special day, leaving skin flawless and tattoo hidden. It top secret. Shhh! This clever cosmetic camouflage kit has been developed with professional skin camouflage experts at the Dermatology Department at St Marys Hospital. The Tattoo Secret Kit comes with simple to follow step-by-step instructions to guide the wedding make-up artist on the morning of the big day. The make up offers natural all day long coverage that will last from the morning it’s first applied to the last moment of the day. Containing water resistant properties this kit means dancing and perspiring won’t blow the cover. 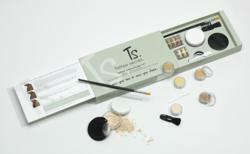 The kit can also be used on honeymoon as each kit has enough for multiple applications. Tattoo Secret’s powder coatings in between the layers of camouflage creams will hold tight through the weather, water – so it's easy to be tattoo free on the beach too! Tattoo Secret contains stacks of base and top coat shades to ensure a good colour match, plus all the tools to help you achieve a perfect finish. The kit is available in two skin colours, Light and Medium and costs just £29.99. The neutralising and finishing colour are based on traditional camouflage formulations. They contain beeswax, jojoba, avocado oils, camomile extract and vitamin E to care for the skin whilst camouflaging. A key ingredient is Titanium Dioxide which offers natural UVA and UVB protection. Please visit http://www.tattoosecret.co.uk to view more of our products. Tattoo Secret Kit is available to buy from http://www.tattoosecret.co.uk. The site provides the shade range for simple selection and further application tips from our camoufage expert Maggie Richards. First cleanse the tattoo area to make sure the skin is clean and ready for the neutralising colour. Ensure the cleanser is not oily or the product will slide off the skin. Use the spatula to place a little neutralising colour on the palm or back of hand. Take small amounts of the colour onto the concealer brush and apply over the tattoo using short strokes and spread out into a thin layer. If you are covering a small area dab the neutraliser onto the skin. Add layers until you are satisfied that the tattoo colour has been blocked out. Blend the edges using your finger tips. Finish off by taking some powder onto the powder puff and press and roll it across the covered area. Dust off excess powder using the mini brush provided. Select a colour to match your skin tone. Apply over the neutraliser to create a natural finish using the same techniques as in Step 1. Do this gently to avoid disturbing the under layers. You may prefer to use your fingers to dab the colour on. To get a natural finish blend the edges carefully using your fingers. Use layers of the finishing colours until you are happy with the colour. Remember to gently roll the powder on using the puff as in step 1. A soft travel bag at £27.50 is purchasable on the site, for those that want to take their tattoo kit away on honeymoon to cover their on the beach.